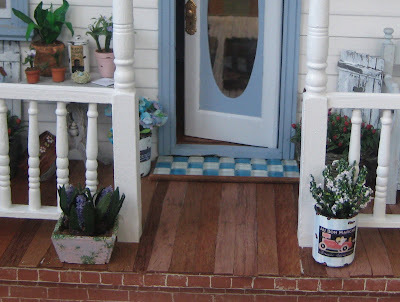 Here's what I made when I needed some plant pots for the front porch. 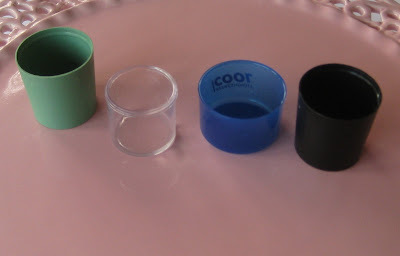 And here's what I made them from...mostly lids...nothing around here has a lid on it anymore! Even Liberty's been helping me, she's been smuggling lids home from kindy, lol! I have been the lucky recipient of some beautiful gifts in the past week or so. 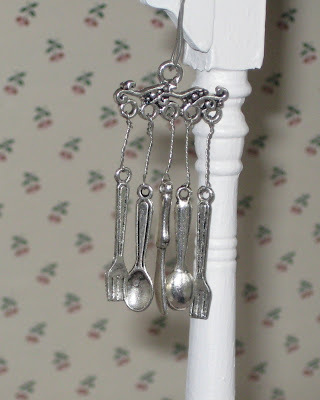 Sans made me this beautiful mini cutlery wind chime. She didn't know that I have a similar 1:1 version of this given to me by my sister as an engagement present many years ago, because she knew I wanted one so badly. The real one chimes very loudly so it's hanging inside the garage out of consideration to the neighbours, lol! 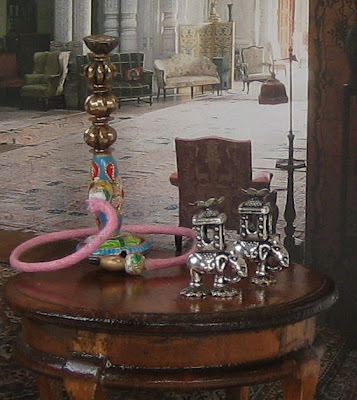 I have also been fortunate enough to have received these limited edition hookah pipes from the Emperor's Emporium. 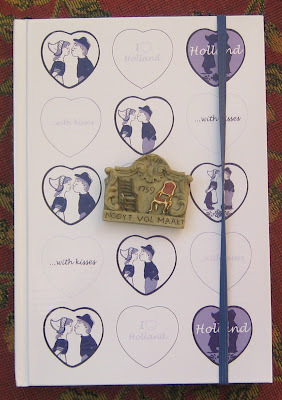 And from Sylvia - a beautiful Dutch book to write all my ideas in, I needed that! And the 'gevelsteen' on top of the book is to go on the front of a house...I believe I will one day be building a Dutch house, lol! 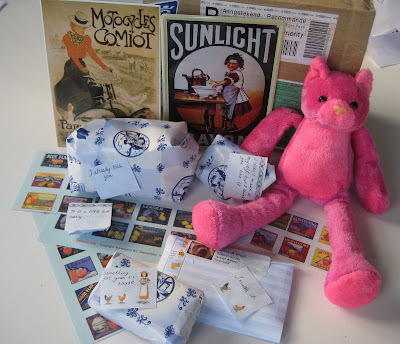 Also from Sylvia - dollhouse mail, how cute is that!? And a gorgeous Hummel plate which I just love! And a little wire bath rack and teensy, weensy duck. 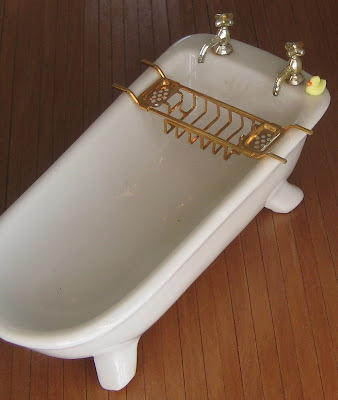 I had never seen a mini bath rack before, it is just perfect! And here we have the final stop on the tour, the kitchen. The kitchen before the renovation, the white sink top I removed and used when I made my new cabinets. (Unfortunately I threw out the birdcage, now I wish I had kept it!). The kitchen is on the ground floor with two doors through to it from the lounge. The loaf of bread came all the way from Hanna in Finland and the knife was made by Sabiha. The cake mixer was something I couldn't resist, I bought it at the show. The sweetest little block of butter is such a perfect replica of the butter we have here in New Zealand it was given to me by a lovely lady at the show. The coffee pot I bought at the show, it was terribly expensive but I have wanted one for such a long time. 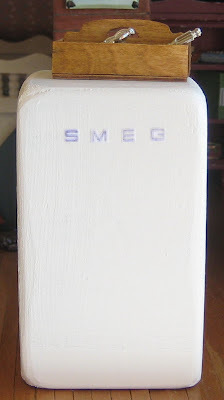 Now, the fridge is still not quite finished, it needs a handle, I have an idea of what I want to use now I just have to find it. And here is what I used to make the fridge...once again from the Japan shop. I couldn't believe my luck when I found this box and it was exactly the right size. I sanded off the top to corners to make it more rounded. 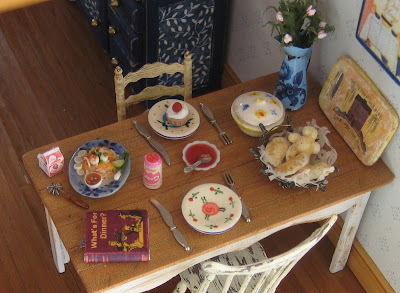 That tiny whisk on the table was made by Sabiha and a lady at the club made the tiny box of cream. 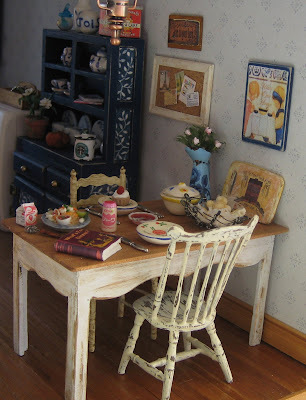 The book on the table is titled 'What's for dinner?' The cupcake was from Katie and the basket of bread from Hanna. 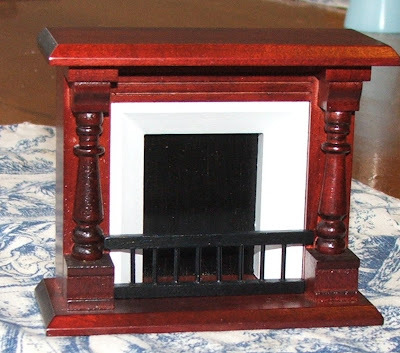 The cute little board with the primitive house on it was given to me at the show by Carolyn (who gave me the butter) who found my house inspirational! She also gave me the sign by the notice board there, it says 'Just do your best'. Because she said so many lovely things about my house (Carolyn really liked all my primitive and country things) I made her some country canisters to give her on the Sunday morning. 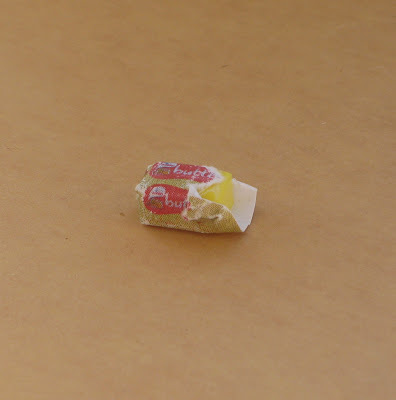 But she came to me first with some little gifts! So I even did a swap at the show! 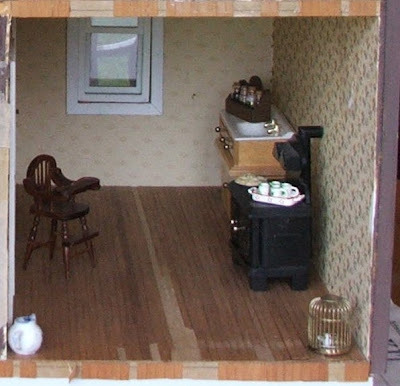 The chair came with the house. It was painted shiny brown. 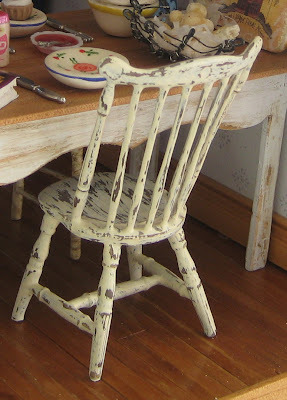 I repainted it cream and then sanded it a bit and now I think it really looks like distressed wood. And here is another example of Anne's genius. This is the chimney breast where an old coal range would have been (the one in there is just temporary - it's all I've got!) 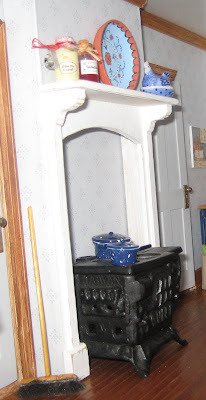 As the house has been modernised by the current owners a new stove will one day go in there. 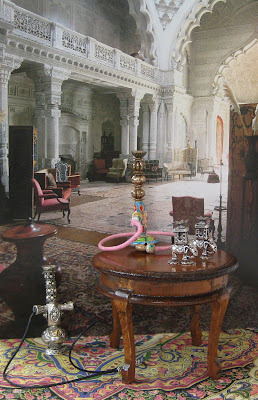 Having the mantlepiece there was a great idea for display purposes. I still need tiles in the back of the recess. 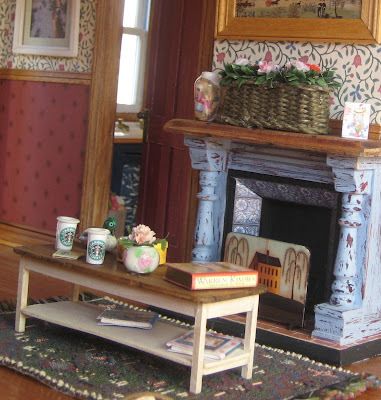 There's Sabiha's beautiful handpainted bowl on the mantlepiece and Hanna's preserves. 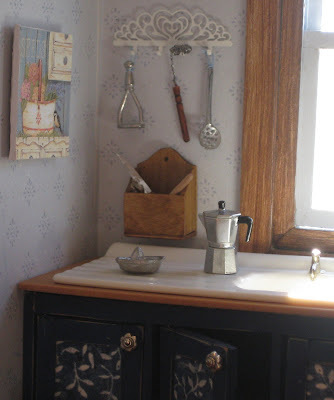 The second hand dresser I painted and papered to match the cabinets I built. 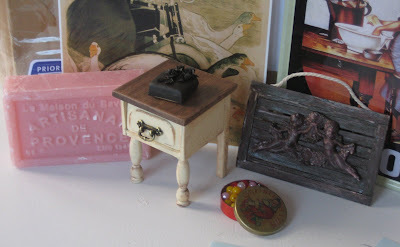 There's one of Rosanna's teensy teapots on top and a beautiful ceramic French bead from Sans that says 'bourjois'. 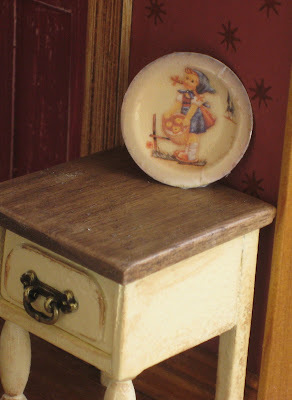 Sylvia's gorgeous baby plate and bread container, the rooster is a wooden button. 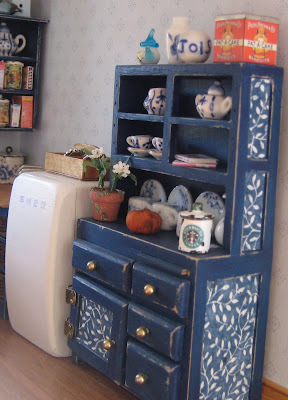 And this cabinet I am most proud of because I made it all by myself, no pattern, no power tools! It was one of the first things I ever made and the door even opens!!! The kitchen handles are little jewellery making things with a pin stuck through them. So that's how the house looked at the show. Sorry the photos aren't all great, it's winter here and it's very tricky finding the right light to photograph things in. I have made a few new things since the show which I will show you soon. Just look at the pretty mail that arrived in letter box on a cold and frosty Saturday. 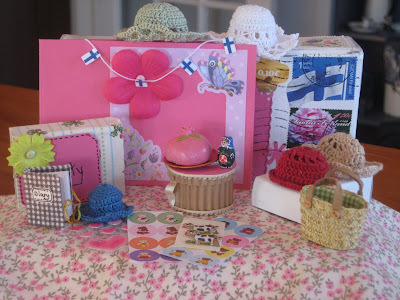 I have just done a swap with Tuulia and she sent us the most beautiful package of goodies! Tuulia's specialty is those gorgeous crocheted hats. But she sent us so many other things. 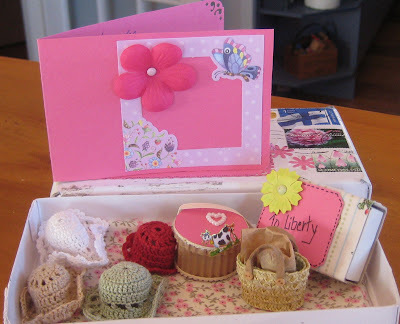 There was a little fabric covered box with Liberty's name on it and inside was that cute string of tiny Finnish flags, the little blue hat and a teensy diary and some tiny stickers. That diary is beautifully made. 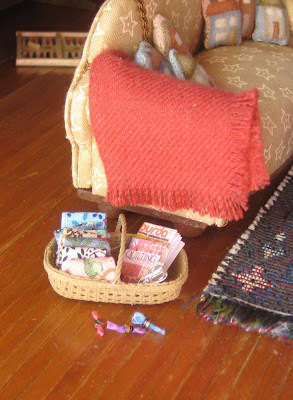 And then there was the pretty fabric and that gorgeous tiny basket. But look at this!!! 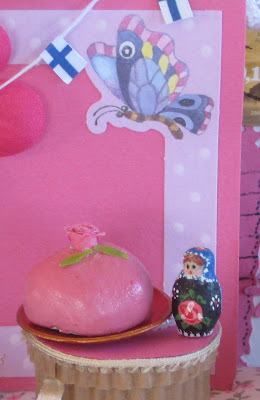 A beautiful pink cake with a gorgeous rosebud on top and the smallest sweetest Baboushka doll. Even hubby was amazed by the beauty of that tiny Baboushka - just 1.5cm tall - handpainted by Tuulia. 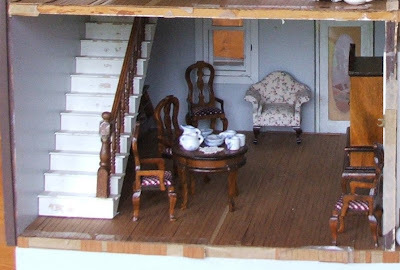 The detail on it is astonishing! We have been so lucky to have some more beautiful mail from Sylvia to brighten our winter days! This box of beautifully wrapped goodies, each with a little message on it, arrived just as I was leaving to collect Liberty from kindergarten so I took it with me. Liberty desperately wanted to open the box in the car so I gave it to her, it kept her quiet all the way home. There was so much tape around the box there was no chance she could open it! 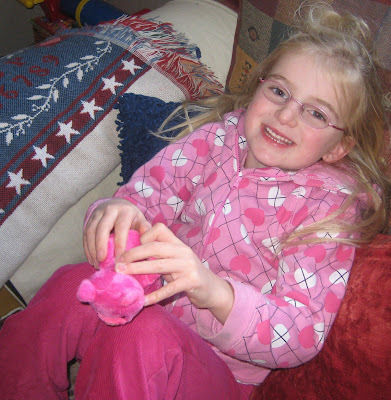 When we did open the box however she found a parcel inside with her name on it which she ripped into straight away, inside was that gorgeously soft pink cat which she absolutely loves, she has been taking it everywhere with her. Along with the tin 'Sunlight' sign for the 1:1 house there was a beautiful rose scented cake of French soap - a real treat for me! 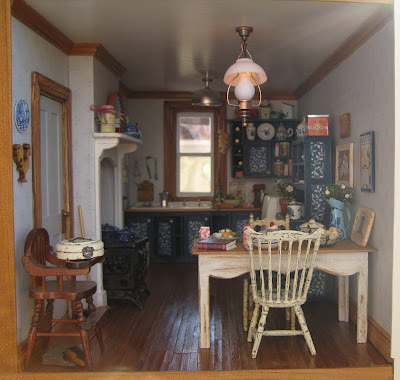 Then there was the delicate little chocolate cake for the dollhouse and a little Christmas tin, a beautiful carved angel picture and that cabinet which was made by Sylvia herself. 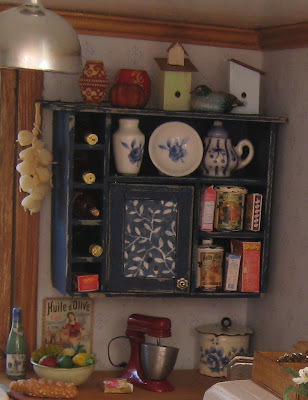 Sylvia is a true artisan, that cabinet is so beautifully made and painted, and of course the drawer opens. Next stop on the tour...the lounge. 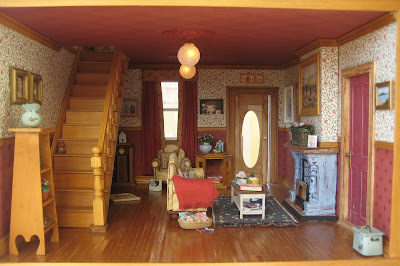 This is a big room (same size as the master bedroom) it still needs a lot more things to make it cosier. The lounge before. Here's the fireplace I installed to hide the wiring. That beautiful basket of flowers was made by Sylvia. Katie, it's a bit hard to see but that's a mini I made of the Mary Englebreit card you sent me. 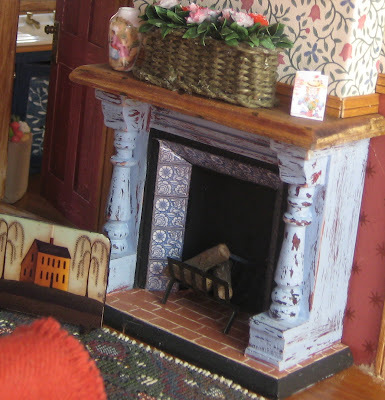 And here's the fireplace as it looked when I bought it...until I got the paint out and distressed it. And here is an original oil painting done by my mother! It's no more than an inch long. Mum bought the little frame at the show and surprised me with this painting. The scene is Rangitoto Island, a local landmark here where I live. Like my sister, mum usually paints big pictures and sells them...and before you ask, yes, I can paint...but I don't! Too many other interests! The old fashioned radiogram in the corner I made at the club. And I just threw that church pew in there to fill up the gap (I think I need a bookshelf there). I made the church pew from a pattern in a magazine. The coffee table I made from some scraps of wood. Sometimes at the club people will give their offcuts away, they always come in handy. 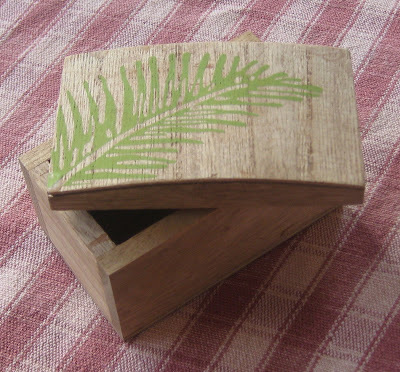 When you don't have any power tools at home it's always a challenge to see what you can make out of the bits you have! 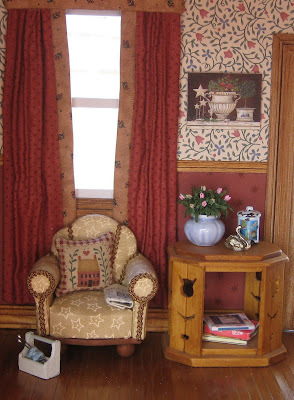 The rug on the floor I made from a piece of tapestry fabric that happened to have designs in rectangle shapes on it. (Easy, peasey lemon squeezy Rosanna!) There's the library table we made a the club, it was a lot easier than it looks! And that's my teensy basket of knitting made by Sabiha. The chair is the same as the Noah's Ark one in the bedroom. 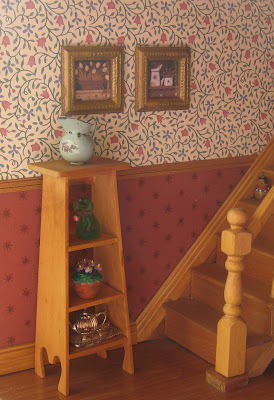 Another cute little shelf I made, of course Liberty thinks it should be a ladder. 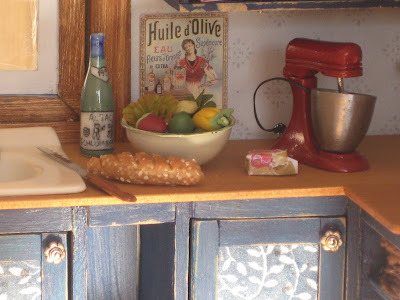 (Please excuse the lump of blu-tack showing under Sylvia's brocante jug, lol!) And someone crafty must live in this house because along with the knitting there's a little basket of patchwork waiting to be done. Well, just one more room to go. Will try and post it this week. It's taken me two days to do this post because of the kids!!!! (Noah had three weeks to do his assignment for school so of course he left it until the last two days) And this morning it was so cold here the computer wouldn't work when I switched it on! We have what they call a 'polar blast' coming up from the South Island. On mornings like this it is actually warmer outside the house! I might have to go and wander around a shopping mall, at least it's warm there! And thank you to everyone who voted for Lucy. She was coming first all week and then another baby joined the race in the last couple of days and zipped past her in the last few hours of the competition. I'm interrupting the tour of the house to ask you to vote for my baby niece Lucy to be featured on a magazine cover here in New Zealand. Voting closes in a couple of days. All you need to do is go here and it'll only take a minute! Here she is with Liberty today. 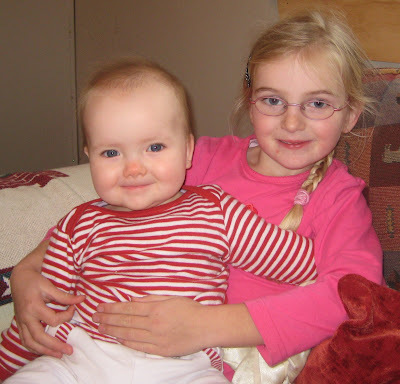 We've been looking after her this morning and Liberty is having a great time being a 'big sister' cousin! The tour will be continued soon! 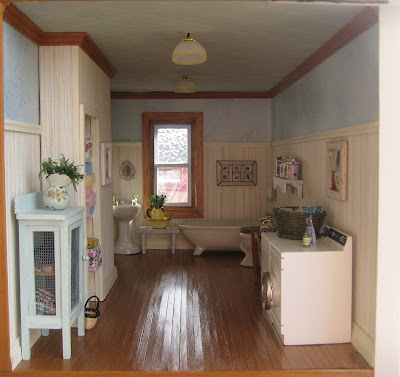 Now this room is probably the one that still needs the most work done on it, still plenty more accessories to be made. 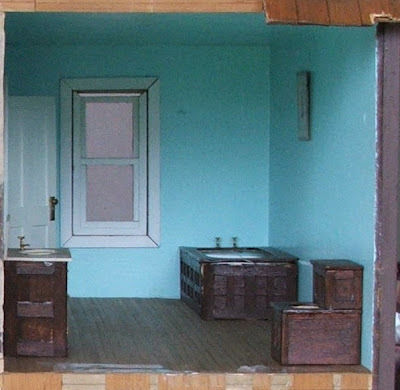 Here is the bathroom before the renovation. 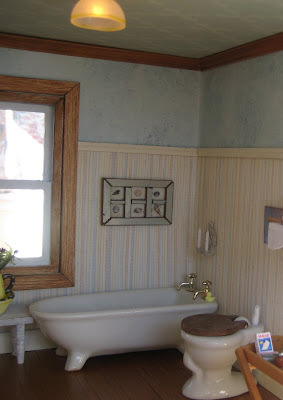 The bathroom is on the second floor with a door through to it from the master bedroom. I haven't decided exactly where the furniture will go permanently yet. 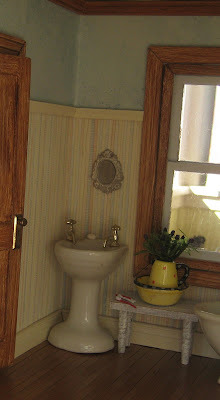 I found that pretty pitcher and bowl at a market, the mirror (and candles above the bath) were a gift from Sylvia. I made the little shell picture above the bath with some of the worlds tiniest shells from a beach near my house, some of them are only 3mm long. I bought the little bottle of 'Stain Away' at the show (very expensive!). 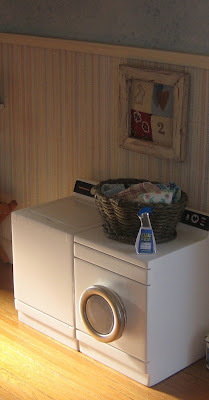 And here's another example of Anne's genius, the linen cupboard. 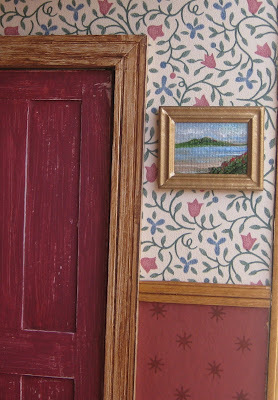 It is the chimney breast on the other side of the wall behind the bed. We were going to put a door on it but decided it would be more interesting to have open shelves, I still need to make some linens to go in there, the towels are made from a set of baby wash cloths from the $2 shop, they were the perfect colours. 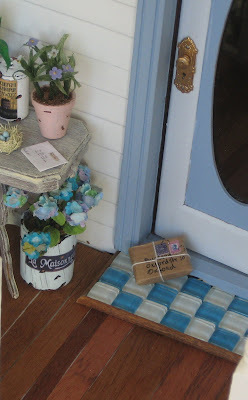 Rosanna's beautiful floral basket is filled with vintage laundry supplies and Katie sent me that teensy basket (it's hiding the end of the skirting that I haven't finished properly yet, lol!) I think I need a little tiny vacuum cleaner to go under the bottom shelf! 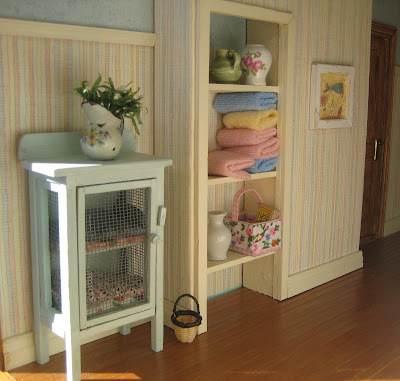 The mesh cupboard was made by a lady at our club (I bought it before I knew how to make things!). The beautiful vintage 'tin' jug (along with all the other brocante in the house) was made by Sylvia. 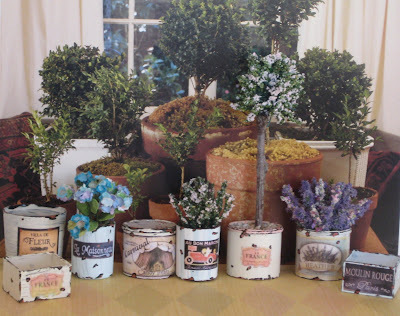 The shelf of canisters I made just before the show, the paint was still wet when I stuck it on the wall. The butlers tray and perfume bottles I made also. 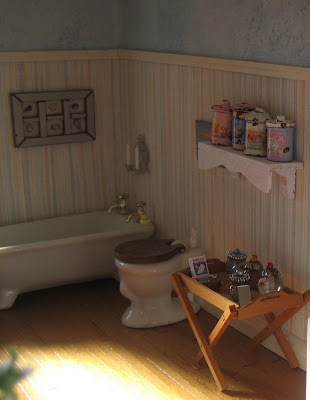 When I first got the dollhouse I didn't want to have to 'waste' a whole room being a bathroom. But now I really love this room even though it's not finished. I think it's because of the wallpaper (it's real 1:1 wallpaper), those stripes are just gorgeous colours and seem to make the room smile! I'm going to have a lot more fun in here! 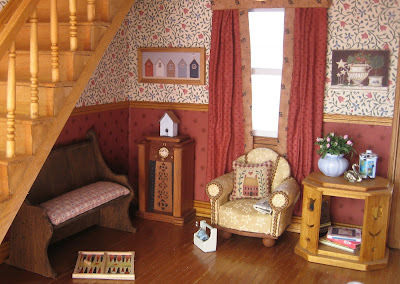 I'm glad so many of you enjoyed the master bedroom, your comments have made me very happy! Thank you all!